Although credited to Wilson Worsdell, these two locomotives were built to the design of his Chief Draughtsman Walter M. Smith. At the time, Worsdell's designs consisted of two simple expansion cylinders, and a boiler with a round-top firebox; but Smith was given the design scope and funding to pursue his own compound expansion concepts. As such, Smith was very lucky and was even allowed to spend more per locomotive than the cost of the contemporary Worsdell C6s. Compound expansion was never very popular in Britain, and Smith's compound expansion scheme was probably the only success. Smith's compound express passenger experiments started in 1898 with the rebuilding of 4-4-0 No. 1619 as a three-cylinder locomotive with a high pressure inside cylinder and two low pressure outside cylinders. 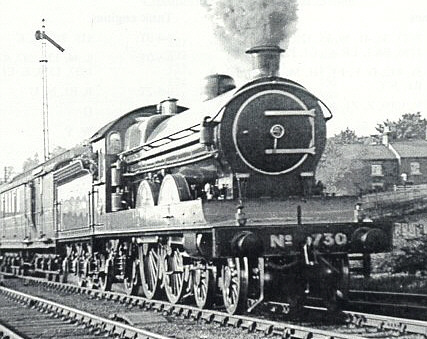 This engine would survive to become LNER Class D19. The next step was a four cylinder Atlantic. Design work began in 1901 and approval was given in 1905. The two inside cylinders were low pressure, whilst the two outside cylinders were high pressure. Two locomotives were built. No. 730 had Stephenson valve motion, whilst No. 731 had Walschaerts valve motion. These two locomotives were an immediate success, and in December 1907 the construction of ten more were proposed but do not appear to have been authorised. Smith died five months after the C8s entered service, and some sources claim that his executors insisted on royalties. This was unacceptable to the NER Board, and the order was cancelled. Smith's ideas on compounding did survive though. Through his relationship with S.W. Johnson, Smith's concepts were used in the famous Midland Compound 4-4-0 locomotives. All four cylinders drove the leading coupled axle. Only two sets of valve gear were used. The pair of cranks on each side of the engine were at 180 degrees to each other with each pair 90 degrees apart. The high pressure valves had inside admission, whilst the inside valves had outside admission. This design also had the advantage of being operable with compound or simple expansion. This proved very useful when starting off or climbing a bank, when boiler steam could be fed directly into the low pressure cylinders. Schmidt superheated boilers were built and fitted in 1915. The C8s were based at Gateshead until 1933, and hauled express passenger trains from Newcastle to York and Edinburgh, for almost their entire lives. On 17th October 1906, No. 730 took the Royal Train with Queen Alexandra from Edinburgh to York - the first time this journey had been performed with one locomotive. Other Royal Train duties were not uncommon during this period, and the repeated use of the C8s demonstrates their reliability at the time. Shortly after Grouping (1923), A1 Pacifics displaced the C8s to secondary express services. In November 1933, both C8s were moved to Heaton for use only on busy holiday traffic, although No. 731 would be withdrawn a month later. By the early 1930s, the superheated boilers reached the end of their economic lives. At a time of financial belt-tightening, the construction of two boilers of a non-standard design could not be justified at a time of financial belt-tightening, and the two C8s were withdrawn. No. 731 was scrapped in December 1933, and No. 730 was scrapped in January 1935. No. 730 had Stephenson valve gear, whilst No. 731 had Walschaerts valve gear. Heating Surface: Total: 1796 sq.ft. The C8s were scrapped in 1933 and 1935, and neither survived into preservation. I am not aware of any models of the C8s in any scale. Thank you to Malcolm Peirson for the photograph of No. 730 at Low Fell. Thank you to the Rosewarne family for the works photograph of No. 730.